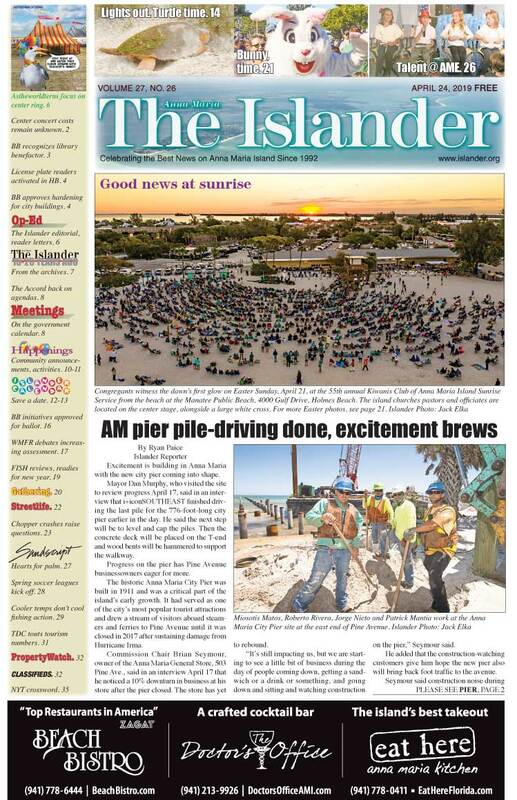 The blame continues to be thrown at Big Sugar, the governor, bad zoning, decades old mistakes in managing wetlands and plans that rerouted the natural flow of water. Who, or whatever is to blame, the harmful algal bloom Karenia brevis — commonly known as red tide — continued to plague Florida beaches. What crept up from the South arrived Aug. 6 in background amounts as far north as Passage Key, a small wildlife refuge in Tampa Bay at the north end of Anna Maria Island. 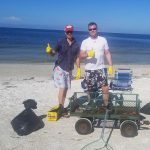 In Manatee County, a public works tractor pulling a large container scraped and scooped dead fish from Anna Maria Island beaches, from the southern tip of Coquina Beach to Bayfront Park in Anna Maria. Volunteers joined in the cleanup campaign — some from as far away as Germany and England. Wearing masks and gloves and hauling garbage bags, Holmes Beach code enforcement officer JT Thomas led a troop of cleaners to the beaches to pick fish left after the county machinery moved on. “We did it once, we may do it again,” Thomas said. “We will be glad to share our bags, gloves — all of it — with other cities and Longboat Key, if need be,” he added. By Aug. 10, county workers had cleaned an estimated 140 cubic yards of dead fish from the island shoreline, according to Nick Azzara, information outreach manager for Manatee County. The Manatee County Board of Commissioners Aug. 7 announced plans to expand its partnership with START — Solutions to Avoid Red Tide. More than $2 million of BP oil spill money has been tagged for the attempt to slow red tide by placing new oyster and clam beds back into the waters around Manatee County. According to START founder Sandy Gilbert, who addressed commissioners, one oyster filters nine-50 gallons of water per day — and oysters eat red tide. Meanwhile, the fish kills continued, the number of affected marine mammals, including loggerheads, rose. Mote Marine was kept busy, collecting nine deceased bottlenose dolphins from Sarasota County waters Aug. 7-9. According to a statement from Mote Aug. 9, the five males and four females would be necropsied at Mote for a cause of death, but red tide is the suspect. 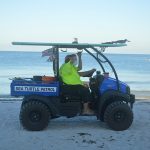 Mote continued to be at the front lines of the crisis, issuing beach reports daily — sometimes twice daily — coordinating efforts with the Florida Fish and Wildlife Conservation Commission and conducting real-time research on red tide. Seeking to expedite fish-kill cleanups, the FWC waived rules for fish collection at Gov. Rick Scott’s direction. The waiver freed up removal of most dead fish regardless of bag, size, possession limits, in-season or area closures. 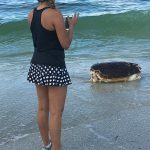 The FWC cautioned people against the removal of sawfish, marine turtles, manatees, dolphins and whales and said reports should be made on those findings to the FWC hotline at 888-404-3922. Up and down the island shore the week of Aug. 6, the numbers of beachgoers were sparse. When Holmes Beach’s Thomas surveyed the beach the morning of Aug. 10, he estimated only 100 people enjoying the sun. Dead fish continued to be present as a county beach-cleaning tractor rumbled down the sand in Holmes Beach. Meanwhile, businesses were feeling the negative effects of the harmful algae bloom. 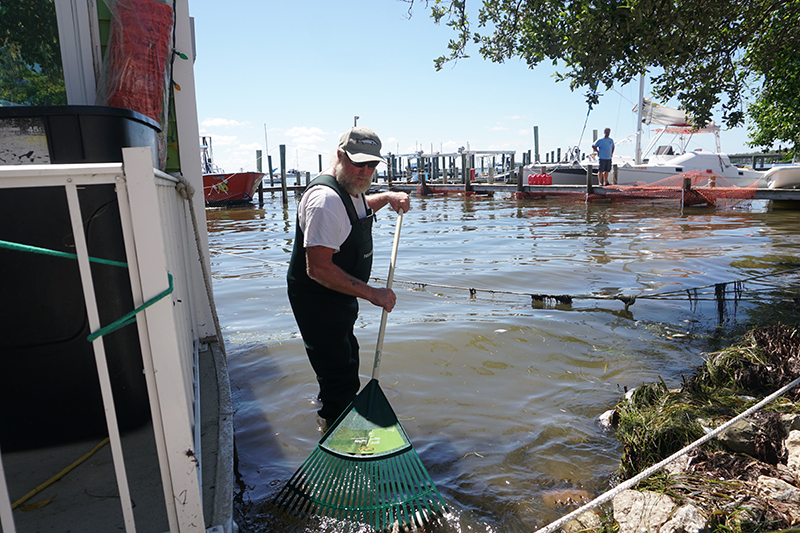 “When it’s killing the eels and snakes, you know it’s bad,” Gary McDonald of the Bridge Tender Inn & Dockside Bar in Bradenton Beach remarked Aug.7. 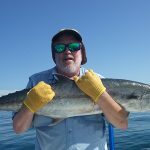 At the Waterfront Restaurant on the bayfront in Anna Maria, culinary director Billy Hermenau said the discovery Aug. 6 of dead marinelife was worse. Restaurant workers collected six garbage bags of dead red grouper, pin fish, sea snakes and a tarpon from the bayfront area near the restaurant. In partnership with FWC, the Collaboration for Prediction of Red Tides at the University of South Florida offers an HAB tracking tool for Florida’s west coast: ocgweb.marine.usf.edu/habtracking.